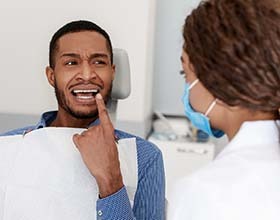 Having an emergency dentist on call is like having a good plumber: most of the time, you hopefully don’t need them, but when you do, you need them fast! If you or a loved one injure your teeth in an accident or develop severe dental pain in Chesterfield, you now have an easy way to get the immediate care that you need: call Yenzer Family Dental. Dr. Jeff Yenzer and our team will be there for you right when you need us the most. When you call in with an emergency, we’ll be ready to offer advice, give first-aid tips, and even provide same-day care if needed. We’ll even come in on the weekends if your situation is particularly urgent. In short, if you have dental pain and want it to go away now, Yenzer Family Dental should always be your first call. Even if you are unsure whether or not your situation is an emergency, go ahead and give us a call, and we’ll let you know what to do next. Often, we’re able to help people resolve their issue over the phone. If we can’t, then we’ll make arrangements to see you as soon as possible.